Much easier than the popcorn popping method, which we do not recommend because hot air poppers aren’t meant for the continuous heat. Have a metal bowl to catch the beans if they come out. The machine will probably hold enough beans to make 2 cups of coffee. About 1/2 cup of beans. If you put more than that, the beans will come out of the popper! Also, the metal bowl will catch most of the chaff. It takes about 2 minutes to complete. During the heating of the beans you should here cracking sounds after 1 minute or so – the cracking sounds will stop after about 30 seconds. Keep heating and wait for the cracking sounds again. It is at this point you decide if you want light roast or dark roast. Turn off the machine when the coffee beans look like the roast you want. The coffee machine might be TOO HOT to touch, so use oven mitts. Pour the beans out RIGHT AWAY, into a metal bowl. Stove method is easier, but the chaff doesn’t come off the beans during roasting. Ventilation is needed, as the roasted beans will produce smoke. Follow the heating time directions for the popcorn popper method above. The only difference is you MUST keep the beans moving during the heating process. 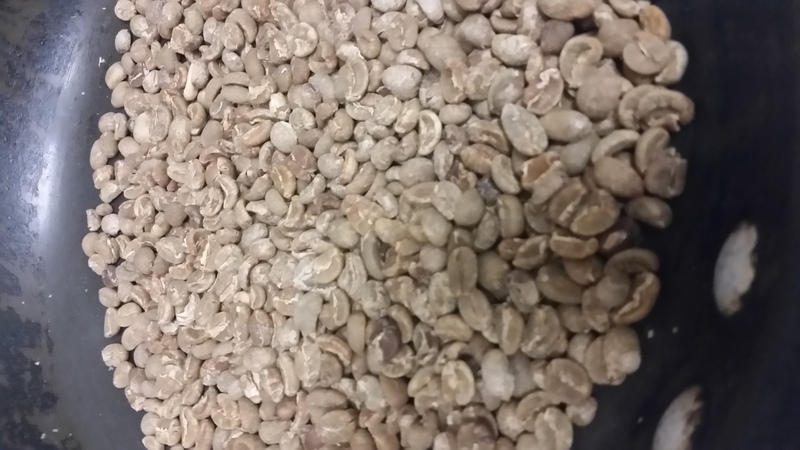 Get the green unroasted coffee beans on Amazon. You are better off getting a roasting machine that is MADE for roasting coffee!